This one is going up a little bit late. I had to pause the movie about halfway through because Jack woke up with a fever, and was crying because he didn't feel well. So... if you've seen tonight's movie, perhaps you'll understand why a child waking up and crying in the middle of it just may freak you out a little bit. I watched the first Paranormal Activity two years ago during the original Project Horror, three days before Paranormal Activity 2 was released. It's hard to remember this now, but when the first movie came out, it caused a real sensation. The ad campaign for it showed night vision footage of theater audiences cowering in fear, covering their faces with their hands, and weeping tears of fright. This isn't a sentiment that originates with me, but it's worth putting out there: too many trips to the same well makes for very weak entertainment. It's the reason why audiences can't even see M. Night Shyamalan's name anymore without literally bursting into laughter. Remember when the very first Saw movie came out? Again, it's hard to remember this now, but it was actually a pretty solid horror movie. It centered around the moral dilemma faced by the two men locked into a room together, while venturing outside the room just enough to fill in the rest of the story. But the longer the Saw series went on, the less it was about those interesting situations, and the more it was about ridiculously baroque traps. And as it went on longer still, it would desperately try to tie the chapters together with stuff like "remember in the second movie when a seemingly insignificant background character did this certain little thing? Well, it's actually incredibly meaningful now that we're in the sixth movie, because it turns out that they were setting up this certain other thing! Look how clever we are!" 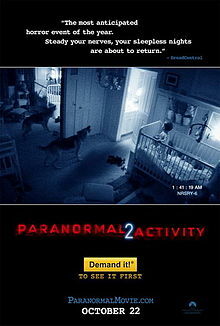 As I type this, Paranormal Activity 4 is due for release in about a week and a half. It probably isn't fair to hold that against PA2 before I've even seen it, but I couldn't help going into this movie without thinking of the Saw series' diminishing returns. Before I watched this movie, I wondered if it could possibly pack as much punch as the first one did, since it's basically the same gimmick, surveillance and handheld footage of spooky happenings. This movie is a prequel to the first movie. In case you don't figure that out on your own, they handily clue you in to it by reminding you that a character who you are seeing onscreen met an untimely end in the first movie. Kristi (who is the sister of Katie from the first movie) is Dan's second wife, and the movie begins with them bringing home their newborn son Hunter. Dan and his late first wife had a daughter, Ali, who is taping the homecoming with a handheld camera. After their home has a burglary, they install a closed circuit camera security system, and it's from this that most of the remaining footage comes from. Just like in the first movie, strange things begin happening - doors closing on their own, pots and pans falling in the night, birds flying into windows, etc. As the weirdness escalates, we learn just a little bit more about the strange experiences that Katie and Kristi had as children, and how the things happening now are related. Ali discovers a bit of family history that may help explain what's happening, and why so much of the activity seems to be centered around her baby half-brother. Will this information rid her family of the troubling supernatural activity? On the plus side, I did like the way that this movie expanded the first one's story, and filled in some of the blanks about why things were happening. Having things happening to a full family, instead of just a couple, worked well to heighten the stakes. On the negative side, the found footage, surveillance camera thing was worn so thin by the end that I just can't believe they've milked this franchise for an additional two installments. Also, I understand the value of a slow build in horror sometimes, but GOOD GOD does this movie take its time waiting for something to happen. It's not a bad movie, it's just not all that original anymore. I give it three incense bundles out of five. Tomorrow night: This brings us to the end of the Cults & the Occult block! Tomorrow night begins Cannibals, Zombies, and Nazis (Oh My!). First up - Jungle Holocaust.